After 9 years teaching 1st grade, I am moving to Kindergarten! I am very excited about the change and a bonus...I get a bigger classroom! 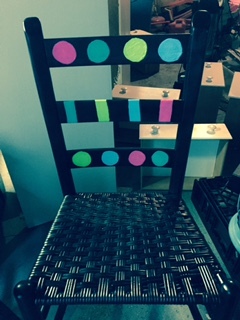 Here are a few of my projects, as I am giving up my safari theme and going with a chalkboard and bright color scheme. Read the room pointers will go in these. This will be our sharing chair. There is very little left in the room. The previous teacher taught for 36 years so most of the things were hers and she gave them to her daughters who also teach. I pretty much have a blank slate. I am packing up my classroom across the hall. I originally thought I would go through everything once I moved but realized I better start before...14 years is a long time to acquire "stuff"! I have 3 boxes: keep, give away and recycle. As I am packing up, I place everything into a box. I plan to go through each item again when I unpack and hopefully give away more! I thought I would be a lot further in the process for this blog post, so instead of showing the process, I will ask for your help! Check out picture #2. See the whole wall of cubbies.....what can I do there? I would love your advice on what to use the wall for and what I could put on top of the cubbies! Leave a post comment and the idea I choose will win $10 from my TpT store! Maybe Use the wall so the kiddos could display one thing they want to "show off" right above there cubby?? You could display different books right above the cubby or frame some different education sayings! The bubbly blonde teacher on teachers pay teachers has some great chalkboard and bright sayings I just purchased!!! As the mom of an ADHD boy, try to leave some wall space plain for visual rest. I find myself noticing that we put little people on sensory overload way too often. I've toned down the walls in my high school class for that reason as well. I would use the wall for the list of things for students to remember. I am guessing the cubbies are for the kids' stuff, so make a visual and word checklist for them: When you arrive... and Before you leave... 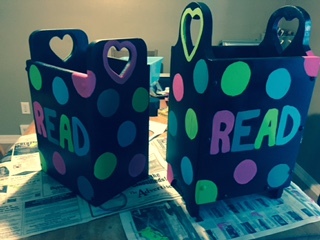 If you don't need the cubbies for coats and such...use them for students to store their book boxes...cover the back of each one with colored paper and their name in big letters.